The University sought a collaborative partnership with a developer to create a very large mixed-use development on vacant land south of the existing urban campus. In its submission as architect and planner, COFFEY GROUP ARCHITECTURE, LLC*. proposed that income generated by University properties, including Student Residences, University Offices, Parking and a Conference Center be combined with tax increment and land sales from privately developed Offices, Retail Space, Cinema, Hotels and Residential properties be used to fund the construction of non-income producing academic facilities, including a new College of Business, Chemical Sciences Building, and a Performing Arts Center. 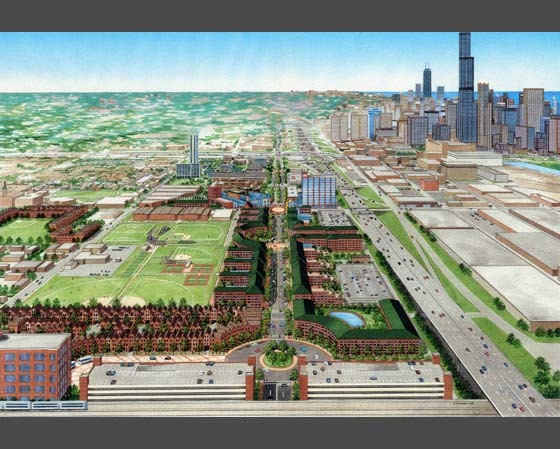 A significant innovation was the creation of urban retail and residential development that would create a new "Campus Town" neighborhood that would continue the transformation of the University from a commuter oriented campus to one that includes an on-campus university community.